In this article we consider how Tasmanian soldiers of Aboriginal descent experienced the aftermath of the First World War, drawing on and supplementing several case studies from a wider body of research Andrea Gerrard has undertaken into the recruitment and front line experiences of these men. Our particular focus here is to examine how the Repatriation (hereafter ‘the Repat’) Commission responded to these men post-war.1 War changed these men both physically and mentally; literally their lives were twisted out of shape in ways that would have been unimaginable when they initially volunteered. We are particularly interested in interrogating whether the Tasmanian servicemen of Aboriginal descent and their families received treatment equal to that being meted out to other Tasmanian returned servicemen. 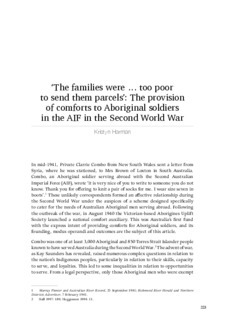 We unsettle notions that returned Aboriginal servicemen continued to suffer significant discrimination with regard to repatriation benefits in post-war Tasmania, while acknowledging that their particular circumstances may have made the requisite application process more difficult than it was for other Tasmanian returned servicemen. As the Repat records have only recently been made available to researchers, it remains to be seen whether such experiences were distinctly Tasmanian or were emulated across mainland Australia.